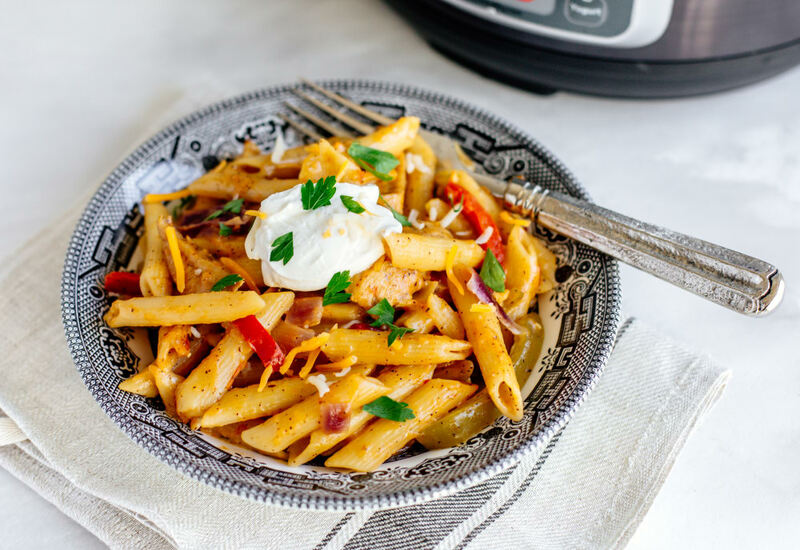 All the flavors of chicken fajitas, packed into a one-pot meal made in the Mealthy Multipot. 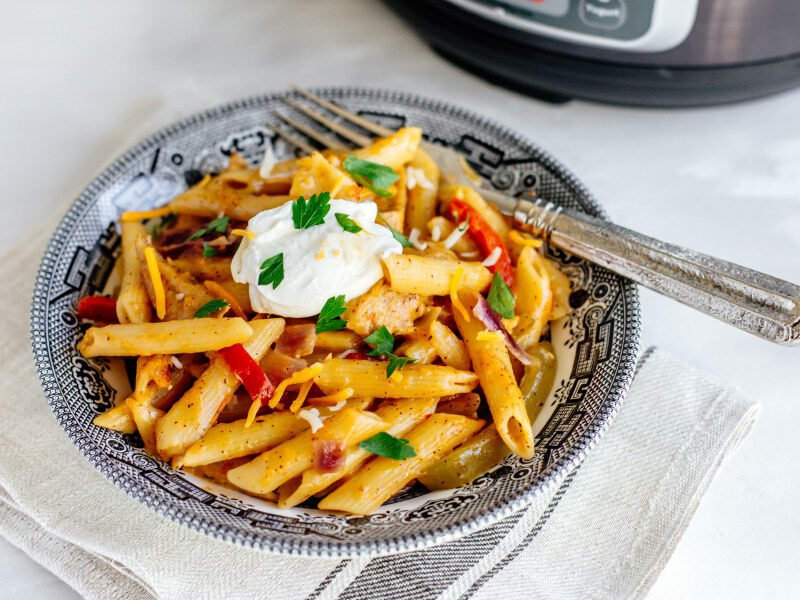 This colorful Tex-Mex penne is perfect for busy weeknights and loved by kids and adults alike. The ingredient list may look long, but the prep is super quick, and the cook time is just as quick! Who doesn’t like a bowl of creamy and cheesy pasta? Combine chili powder, salt, cumin, onion powder, garlic powder, and oregano in a bowl until seasoning is well mixed. Reserve 1 teaspoon seasoning. Coat chicken with the remaining seasoning. Set pressure cooker to Sauté on High. Add olive oil and saute half the chicken strips until lightly browned, 4 to 5 minutes. Transfer chicken to a bowl. Sauté remaining chicken and transfer to the bowl. Lightly sauté onion and garlic in pressure cooker until fragrant, about 1 minute. Press Cancel. Combine chicken broth and salsa in the pressure cooker, scraping up any brown bits with a wooden spoon. Stir penne pasta into broth mixture; top with chicken and bell peppers. Lock pressure cooker lid in place and set steam vent to Sealing. Select Pressure Cook (Manual) and cook on High Pressure for 5 minutes. Let pressure release naturally for 5 minutes, then set steam vent handle to Venting to quick-release remaining pressure. Open lid carefully and sprinkle with reserved seasoning and shredded Cheddar cheese. Stir to combine. Add additional salt, if desired. Spoon pasta into bowls and top with sour cream. Garnish with cilantro and additional shredded Cheddar cheese. Adjust the heat by using mild, medium or hot salsa. Any kind of pasta can be substituted for the penne. Rigatoni or rotini would work well. Three medium chicken breasts is approximately 1 1/2 pounds chicken. Double the Cheddar cheese to make it extra creamy. Or try half Cheddar cheese and half mozzarella cheese. Per Serving: 486 calories; 18g fat; 33.8g carbohydrates; 47g protein; 129mg cholesterol; 1266mg sodium. Creamy, cheesy goodness with lots of southwest flavor. I added black beans and corn as well. Cooking pasta has never been easier! Don't let the long ingredients list fool you - this recipe is incredibly easy. I used gluten free penne pasta for my wife and kids, and they loved it. Also, I cooked the chicken in the pot of the pressure cooker in two batches, and the result was the perfect sear and cooked through to perfection. Tastes just like a fajita too. This recipe was very yummy. At the end I stirred in spinach just into it welted some. I was worried about the bell peppers cooking too long, but everything came out perfect. This was very good although very mild. There was only enough chili powder to color the pasta. I’ll make it again but with more heat.